Solar-Powered Outdoor Lights — Novolink, Inc.
Novolink solar-powered outdoor lights are designed to put light wherever you may need it, from dusk to dawn, powered by lithium-ion batteries that are charged by an attached solar panel. Made of durable, weather-resistant materials, they are superb substitutes for 'hard-wire' lights that require professional installation. 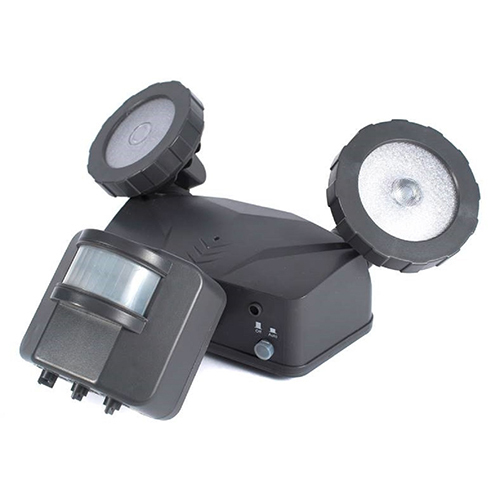 When you need a high-tech, convenient solution in a low-power, inconvenient location, our motion-activated solar security lights are an excellent solution. They gather energy from the sun during the daytime, and turns-on at night when motion is detected, or if a timer is set. The light is designed to optimize output, making the most of power from the dual lithium-ion batteries. 2 x 5W Cree LED lamp heads provide over 500 lumens of output. Control brightness, motion sensitivity, timer, lux and other functions. 2 x 2000 mAh lithium-ion batteries and special management software allow for long running times between charges. During the day, our solar lights gather energy from the sun using a specially-designed solar panel. At night, that energy powers two LED lamp heads that are activated when motion is detected. Special light management systems (coupled with the Novolink App for wireless-enabled systems) optimizes energy output, conserving energy for when it's really needed. The system also accounts for those cloudy, rainy or overcast days when light might not be as abundant, and in ECO mode, can allow the light to run up to 20 hours without charging. Our Motion-Activated Solar Security Light with Wireless Smart Control connects with the Novolink App to allow adjustment of settings and timers via your smartphone. From up to 50 feet away from the unit, you can control brightness, sensitivity, timer, lux and other functions.